The first birds that I stopped to photograph were a family of Common Gallinules. I love to watch the babies. They look like little aliens. 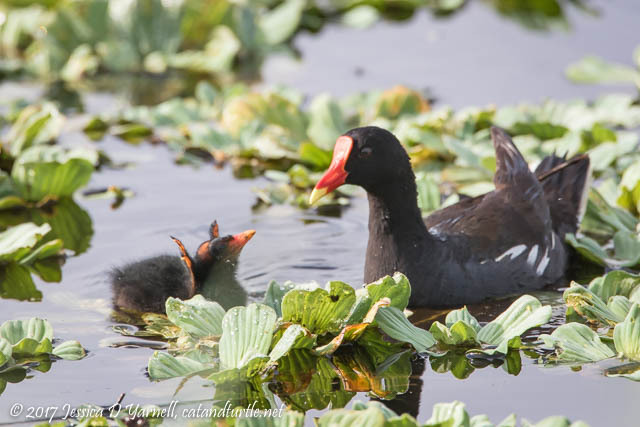 The Common Gallinules are one of the few bird families where the older juveniles from the early summer clutches stick around to take care of the later clutch babies. I think it’s sweet how they stick together. Rarely do I see the tiny babies playing together, but on this particular morning, these two were swimming and splashing together. A closer look revealed that they were squabbling over the same bite of breakfast! Common Gallinule Babies Fighting Over Breakfast. Photographed on Welland Road. Next up was another gallinule – this time, Purple! This bird was very close to the road, and he watched me dubiously as I pulled up. It’s not often that I have a chance to do a head shot of this beautiful bird. I hope he has a nest nearby because I’d love to get close-ups of his chicks! 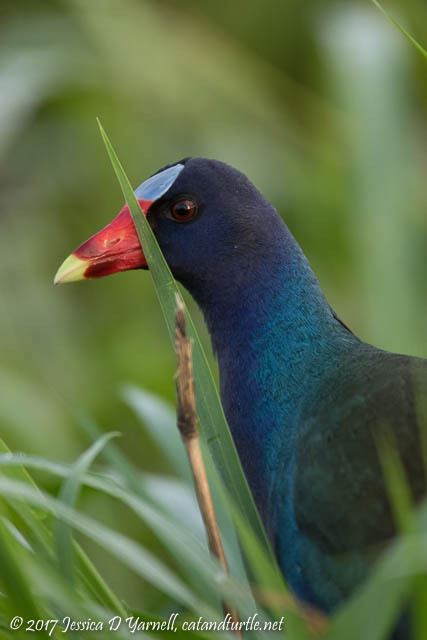 Purple Gallinule. Photographed on Welland Road. 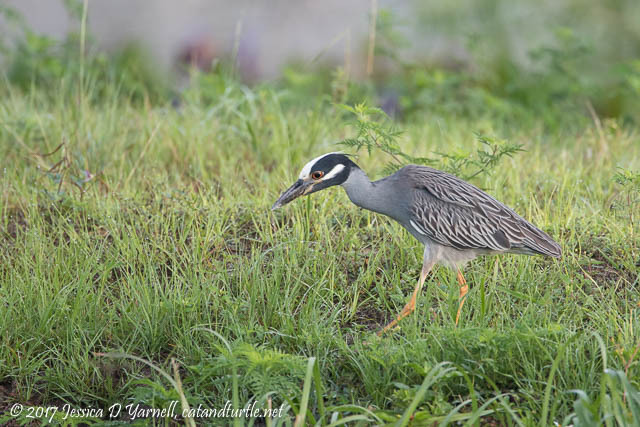 As I turned onto the next road, I noticed a bird that I’ve only seen once before at Lake Apopka – the Yellow-Crowned Night Heron. He used to be a regular at Fort De Soto, and a rarity at the Circle B Bar Reserve, but it’s been a while since I’ve seen one. He was stalking his breakfast. I was glad that he was on the opposite berm, because I had a nice angle with a clean background. Until he headed down the berm! Silly bird. Yellow-crowned Night Heron. Photographed on Roach Road. Next up is one of my favorite birds – the Roseate Spoonbill. There were two of them feeding in a pond off Laughlin Road. This was a Beastly shot with my 2x teleconverter. The birds were actively feeding. With all the motion, I was surprised to get such a good reflection in this shot. Roseate Spoonbill. Photographed on Laughlin Road. Wait, is that a….yep! 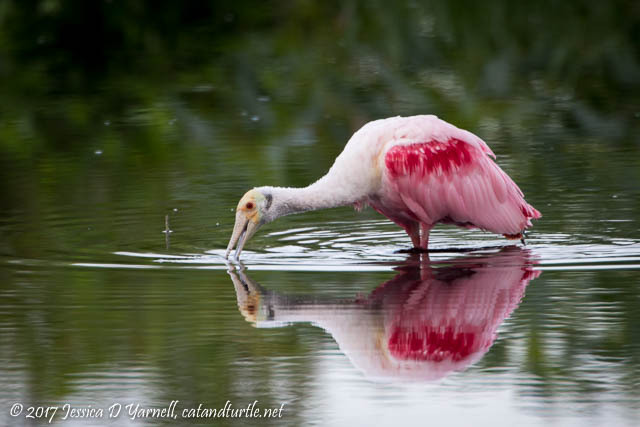 The Roseate Spoonbill was feeing in the same pond as a Fulvous Whistling-Duck. It struck me that they were kind of the Odd Couple, especially as the spoonie spooned right past the duck, and the duck just stared at him! 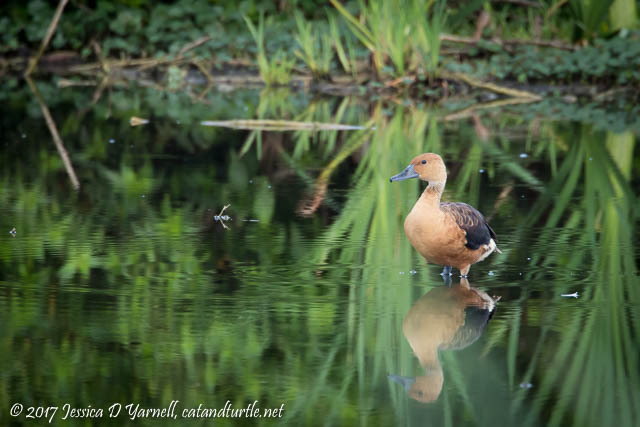 Fulvous Whistling-Duck. Photographed on Laughlin Road. 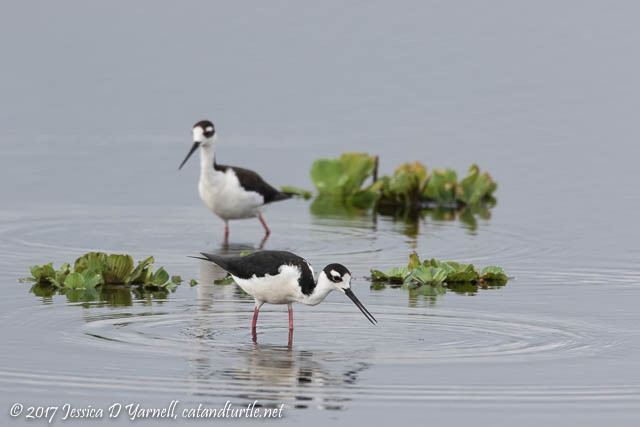 Black-necked Stilt Pair. Photographed on Interceptor Road. Nearby was another family of Common Gallinules. Several “alien” babies were making a big fuss as they swam around. Then Mom swam up with a morsel and this baby went into begging overdrive! I love watching them stick those little stubby wing-lets in the air to get Mom’s attention. 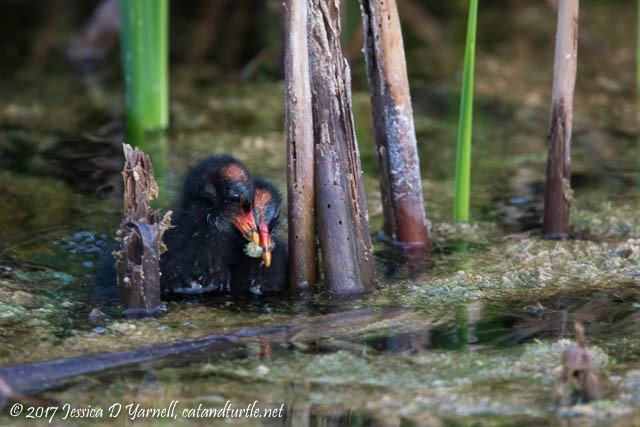 Common Gallinule Feeding Baby. Photographed on Interceptor Road. 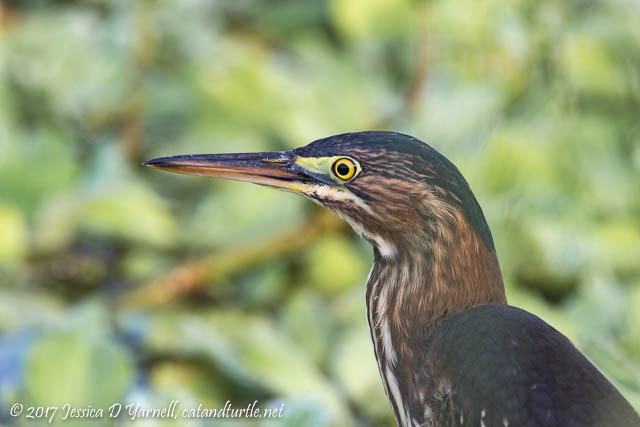 A Green Heron flew in and gave me a rare head shot opportunity as he went stalking his breakfast. I had just been thinking that the Greenies at Lake Apopka always fly before I get a chance to photograph them. I guess this one took pity on me. Green Heron. Photographed at Interceptor Road. 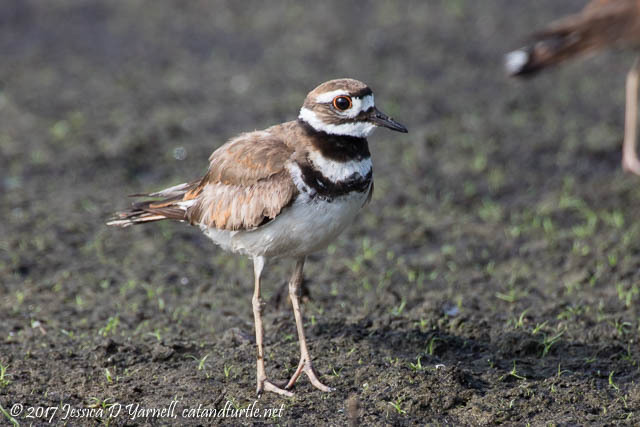 I spotted a Killdeer on a mudflat and stopped briefly to photograph him. When I noticed that it was actually a pair of Killdeer with four tiny babies, I settled in for a longer visit! The babies were so cute. Most shorebird babies remind me of cotton balls with toothpick legs. These were no exception. They wandered fearlessly around the mudflat, apparently not as concerned as Mom was when the Common Gallinule wandered into the area. I got to photograph these guys twice, then I haven’t seen them again. Killdeer. Photographed along Interceptor Road. As I approached the sod fields and started watching out for the Fork-Tailed Flycatcher, a pair of Red-winged Blackbirds caught my eye. They were fledglings, and they were making a big fuss. I had just focused on one when Mom flew in to feed him. Such a great end to a fun morning! 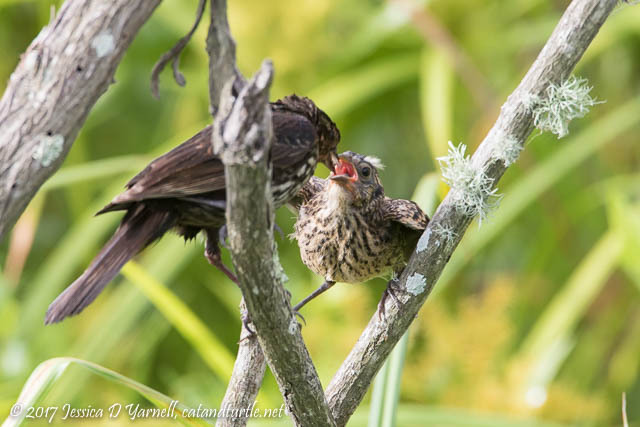 Red-winged Blackbird Feeding Fledgling. Photographed along Interceptor Road. Very nice post and photos. 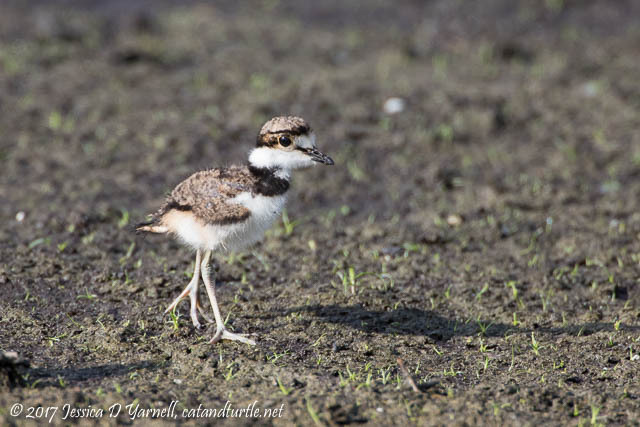 I really like the ones of the young Killdeer – I’ve never seen one. Guess I need to go back out the LAWD. Thanks, Ed! I have not been able to relocate this particular family. 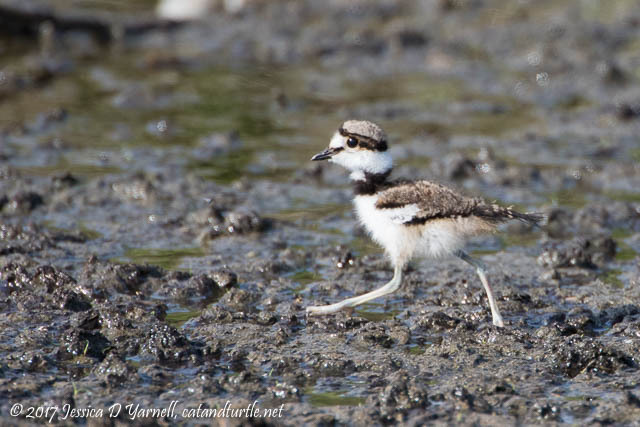 I know there are other baby Killdeer out there. It’s a fun place to spend the morning!